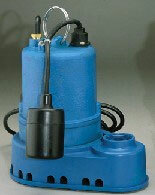 Submersible effluent pumps designed to efficiently handle septic tank effluent applications for the long term. C. W. Sales Corporation, 199 South Forrest Ave, Norristown, PA 19401. Tel: 610-277-6444; Fax: 610-277-3797.